I will be playing quite a bit of Overwatch. That game has my undivided attention for the most part. I will also be playing Legend of Heroes: Trails of Cold Steel. I took a bit of a break from it back in February shortly after Street Fighter V came out. I dove back into it within this past week and I hate that I stopped playing. It is a very good RPG. Also known as the first game in the Mana series, Final Fantasy Adventure will be localized according to the Japanese Twitter account for the game. Final Fantasy Adventure is a spin-off of the Final Fantasy series and originally came out in the U.S. in 1991. The remake will be named Adventures of Mana and is coming to iOS, and Android in the West. The Japanese version of the website also has the PS Vita listed as a platform, but there is no word on a Vita version for the west. There is no release date since Square Enix has not officially announced Adventures of Mana for the West just yet. Check out the trailer below. I’m definitely looking forward to this one as I do have fond memories of enjoying this on my Gameboy, as a kid. I will also be keeping my fingers crossed for a localized Vita version. Keiji Inafune’s long awaited, spiritual successor to the Mega Man series will be released September 15th. If you pre-order, you get the “Retro Hero” DLC that basically looks like a Minecraft version of Beck. 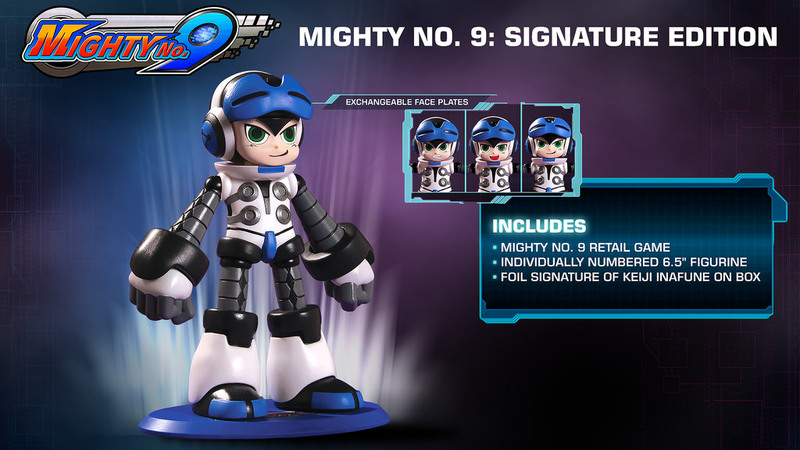 If you want to be a bit fancier, North Americans can pre-order the limited Mighty No.9 Signature Edition. This edition features a 6.5″ numbered figurine of Beck complete with three interchangeable faceplates and 14 points of articulation all for $59.99. Mighty No.9 is being brought to us by Deep Silver and will appear on just about every console under the sun.